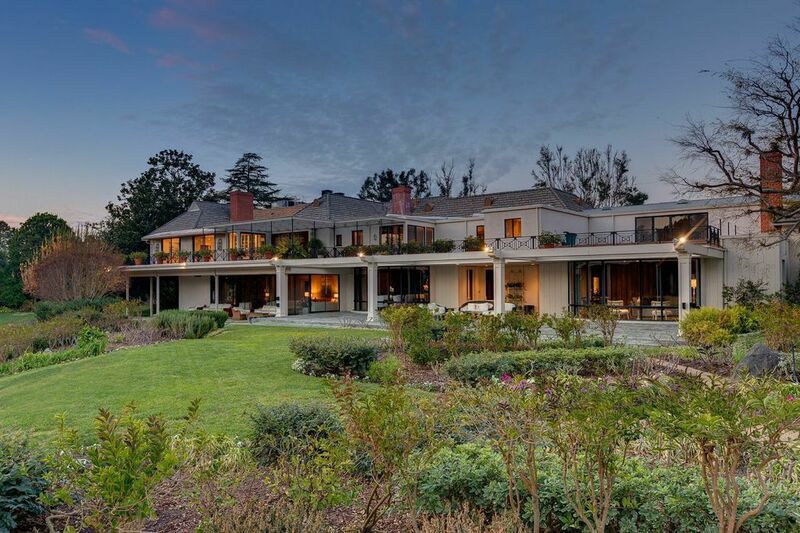 Courtesy of Craig Strong of the John Aaroe GroupBob and Dolores Hope's 15,000 square-foot mansion on 5.6 acres in Toluca Lake is on the market for $23 million. Bob Hope's Toluca Lake home, the place the entertainer and later his wife Dolores spent their final days, has returned to Los Angeles market -- this time with a $23 million price tag. Toluca Lake is a neighborhood just north of Universal Studios where Steve Carell, Zac Efron, Kiefer Sutherland, Miley Cyrus and Melissa McCarthy also live. The Hopes' English traditional house, just a half mile from where buddy Bing Crosby lived, is far less spectacular than the couple's Palm Springs contemporary, also on the market with a 50 percent price slash to $25 million. The 5.6-acre Toluca Lake property -- really, a gated compound –- was "the" place for entertainers and politicians to meet and greet in the 1940s and 1950s. Richard Nixon reportedly once landed his helicopter on the grounds on his way to play golf. At one time, the Hopes were considered among the largest private landowners in California. But of their many properties, this Toluca Lake estate is where they called home. Hope would often drive a golf cart around the neighborhood on his way to the Lakeside Golf Club down the street. Obituaries for the couple say they both died at home in Toluca Lake -– Bob at 100 in 2003 and Dolores at 102 in 2011. The property spans four parcels and clearly dwarfs anything in that neighborhood. It has a large main house, pool house, and staff quarters/production office. It originally was listed for $27.5 million in 2013, then reduced to $21.8 million when two acres were lopped off the listing, taken off the market for about five months, then returned with those two acres for $23 million. The 15,000 square-foot mansion was built in 1939 for the Hopes by architect Richard Finkelhor (who also designed homes for Zeppo Marx and Barbara Stanwyck), and later renovated in the 1950s by John Elgin Woolf, known as the king of the Hollywood Regency style that melds 19th-century French, Greek Revival and Modernist styles into a glitz-glam look. Woolf's celebrity-studded client list included Judy Garland, Cary Grant, Katharine Hepburn, Spencer Tracy and Lillian Gish. Eight bedrooms and eight baths. Master suite including fireplace, dual bathrooms, sitting room, and glass sliders to a huge terrace. Library, bar, and billiard room. Listing agent Craig Strong hopes someone who loves the Hope history will buy the estate, renovate a little -- no one has lived there since 2011 -- but basically keep it intact. Lacking that, Strong imagines a developer will buy the corner estate, and perhaps the Hope-owned property on the three other corners that are listed in a separate deal for about $5 million. "Whoever buys the main estate has the first right to buy the other corners, too," Strong said.